At first it seemed rather unusual to be invited to give insight lectures on solo Bharatanatyam on three consecutive evenings as part of a festival titled Eka Bhavana in Kuala Lumpur, Malaysia. However, once I formulated my thoughts on the subject it became clear why it was important to articulate the core idea of solo dance, and also why I was chosen to do it. I have always been a votary of the virtue of "thinking clearly" about the arts. And I had carefully studied the principles of the dance both as practitioner, and observer. The nuances of classical dance as I know it, are so refined and aesthetically appealing that there is no way its contours can be compromised or watered down. From the time I was a novice, I consciously developed the subtleties and suggestive quality of dance. I think the mastery of technique has an inbuilt regulatory concept. Based on the adavu system, which the nattuvanars taught us, I could sense the well thought out geometrical strength of my dance. I understood the beauty of the perfect outstretched arm in Alarippu, the triangle formed by the Araimandi, the straight lines and curves of the arms and the shift of the body across the stage in a delightful variety of angles, as parts of a composite whole which produced the visual impact of the solo dance. Less is more, I learnt, from my gurus. While space and time are covered by the movement of the body, the heart and soul of the dance is brought to life by the hand gestures and facial expressions. I understood the silence of stillness, as well as the vibrancy of a face lighting up in a myriad emotions. Whilst my gurus laid the foundations, it has been my personal explorations that enriched my dance with the coordination of body movements and gestures as well as expressions. I always point out to students that this harmony does not happen without much thinking and conscious execution. Early in my classical dance journey I understood the support of classical music. The choice of song to dance to became very vital to the distinct identity of my dance style. Eschewing the compositions that did not fall within the range of the classics of our music, both specific compositions for dance as well as those found suitable amongst the works of renowned composers, was very essential to the quality of my solo dance performances. I know the right music. I also know what I do not want to dance to. The making of the correct choice has always been very important to me. These are the things I pointed out in EKA BHAVANA. I am very happy that in Malaysia a step has been taken to rekindle interest in and encourage solo Bharatanatyam. This is a serious art, and when people take a sincere stand to understand what it means, I feel a sense of gratification. Ajit Bhaskar is now a renowned guru, based in Johor but known all over Malaysia. His dance is vibrant, energetic and also emphatic. It was indeed nice to see his solo performance, and understand his approach. Nrtta and Abhinaya mingled perfectly, showing his mature approach, his mastery of rhythm and also his total immersion in the emotion he was portraying. Judging by the big audience turn out, one perceived that Ajith is a star in his country. Not basking in the glory of his own achievements, he is guiding, teaching and bringing up the next generation to delve deep into solo dance. Parvati Nair, his student, showed her talent as well as her maturity. 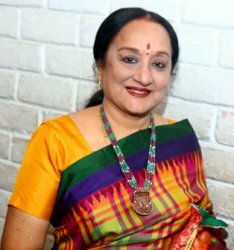 The fact that her husband is a mridangam exponent, and collaborates in her dance by accompanying her, made the show perfect in technique. The solo dance festival was organized by three like-minded persons involved in Bharatanatyam under their respective institutions' banner - Ajit Bhaskar of Suvarna Fine Arts, A. Thiban of Lahari Theatre, and A. Thevasakayam of Tanjavur Arts. When three aficionados of dance get together and line up senior and upcoming dancers to showcase their work, one sees variety and contrasts. The dancers had all worked hard, and so had their teachers. So, not surprisingly there was not a dull moment in the three day festival. Krithika Ramachandran, daughter and disciple of Guruvayur Usha Dorai, brought sparkling agility to her dance. Yamuna Ramesh who brought to mind the young Kumari Kamala of Madras, performed with ease bringing her Temple of Fine Arts experience to full advantage. Daisy Rani Vijayakumaran, tutored by the senior Kalakshetra alumnus Shangita Namasivayam displayed skill and poise. The fitting finale was the impressive performance of Sai Raja Rajeswari, dancing with verve and innate talent the teaching of Chitra Visweswaran. Such a festival must be lauded and supported in the future. Quite in keeping with the success, the dancers were felicitated with the titles, Natya Thilakam and Bharatha Thilakam.